Over the years, I have accumulated a collection of short and long necklaces. Most of them dainty, their chains getting tangled when I try to lay them flat next to each other in the glass jewelry box perched on my dresser. So, I was looking for a way to display them without the mess. 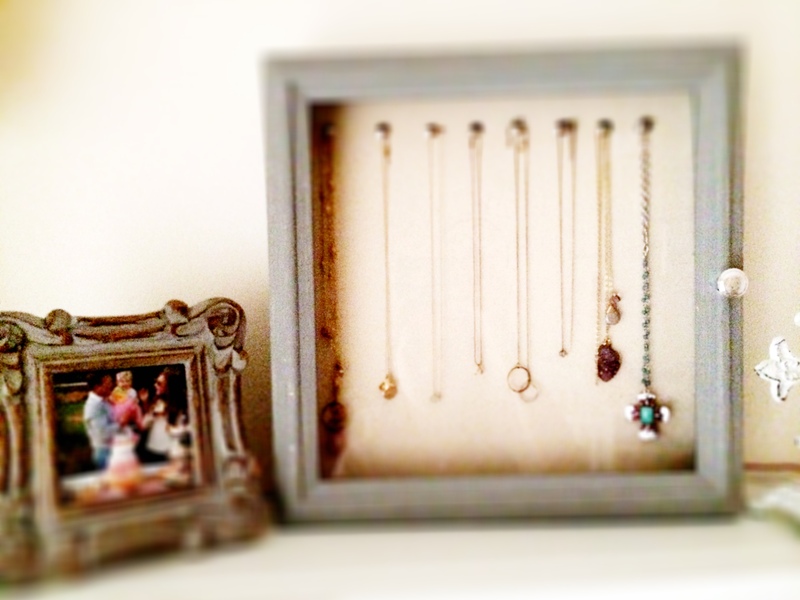 This is a simple way to store necklaces (or other pieces) and you may already have the supplies in your home. 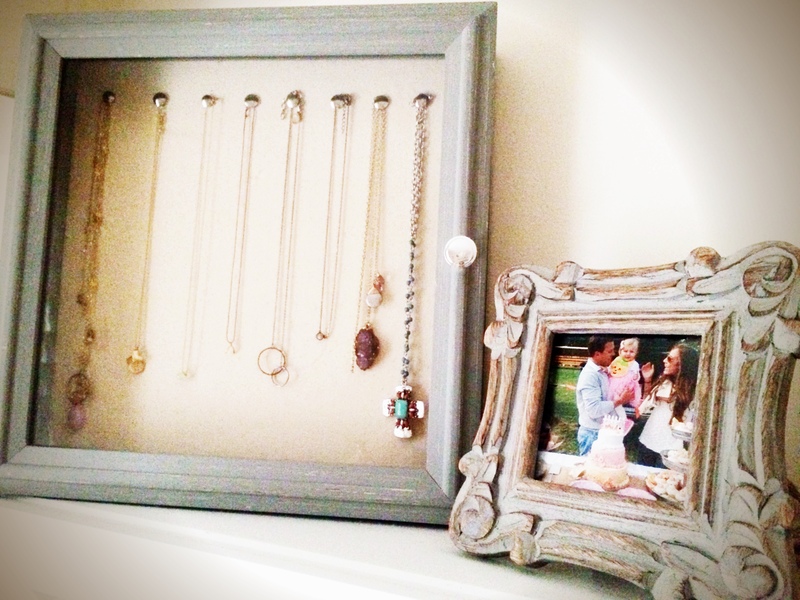 Start with a shadowbox that you may already have lying around and unused or in need of an update. Then, I rounded up some shiny, round, solid-head silver thumbtacks because they would match the door-pull perfectly and went well with the distressed gray paint. 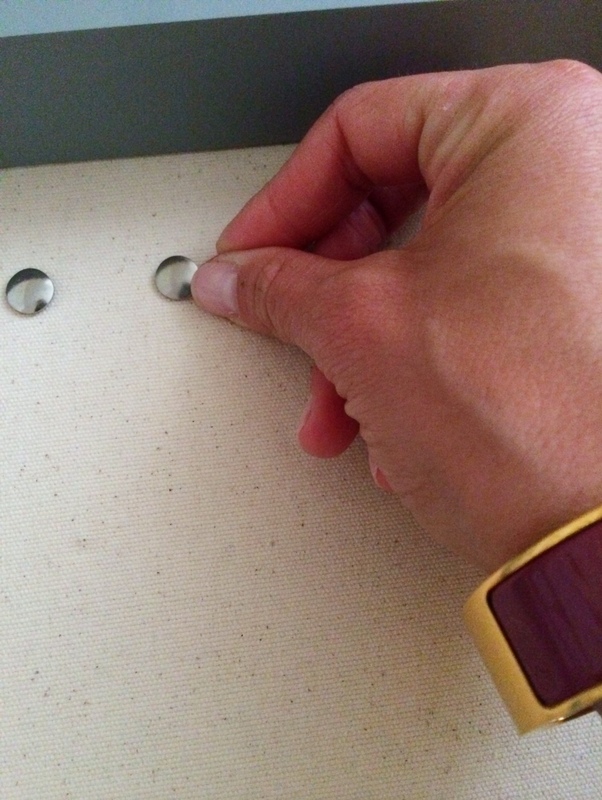 You can also use decorative pushpins or glass head pins typically used by tailors that might also be lurking around your home, hidden in a sewing kit. 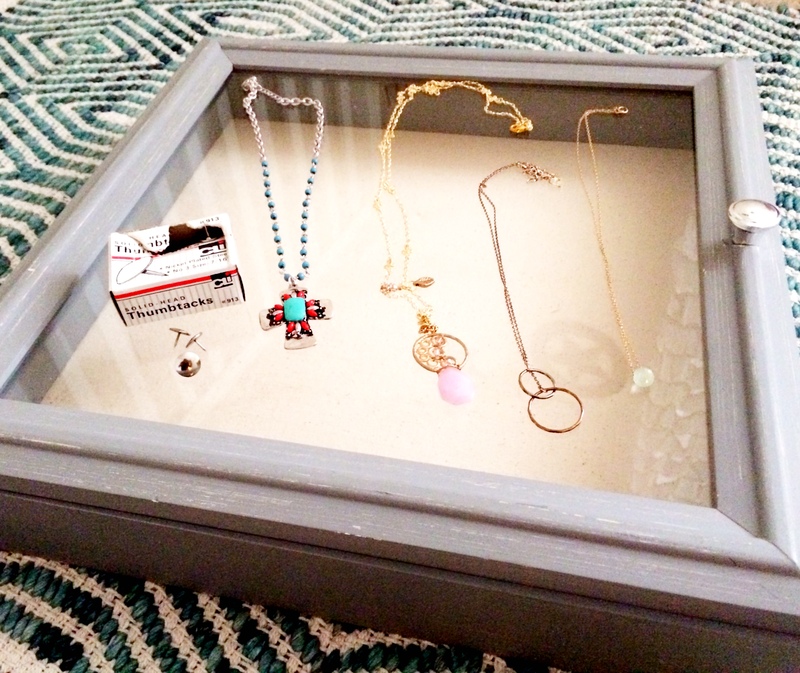 After choosing a few necklaces to display (try not to pick anything too chunky), press your thumbtacks into the back of the shadowbox, spacing them out evenly across the top. Hang the chain of the necklace right over the round of the tack and if needed, press down on the tack again after placing the necklace over it to ensure it stays in place. 1. You can also mount this on a wall with two simple nails, one on each side of the back of the shadowbox or with a wire strung across the back, only requiring one nail in the center. 2. Etsy has some really great decorative tacks to choose from. Such a great way to display necklaces! I need to do this – mine are hanging on a mannequin and get tangled all the time! Always so frustrating when I am running late and cannot seem to untangle the necklace I want to wear with my outfit that day! This shadowbox really keeps things neat and organized! Thanks for sharing! !